Will Apple and Fitbit make a mark or leave Xiaomi and Huami to clean up? If ever there was a sure bet, it's the health and fitness boom in China. The middle classes are growing and they have plenty of disposable money to spend. The government predicts fitness and sports business will be worth $800 billion by 2025. The revenue from Chinese gyms and health clubs has already doubled in the past five years to $5 billion. Investors are throwing money at Chinese fitness apps like Codoon, with its millennial fans and Keep, with its 30 million users. And China loves wearables. When just 100 million wearable devices are expected to ship in 2016 and 9.54 million sell in China in just three months, that's big news. For wearable tech makers in the US and Europe who have had the lights turned on as to China's potential, then, the following may come as a bit of a blow: Xiaomi got there first. Not just Xiaomi but its partner Huami and companies like Lifesense, which is also already selling millions of cheap activity trackers a year. In short, the time to hesitate is through. Even those of us with an anti-business brain can do the maths. The success, or even survival, of global, fitness wearables and companies could be decided by the Chinese middle classes. More specifically, the fashion obsessed, tech inclined and health conscious cohort of the 385 million+ 18 to 35 year-olds in the country. So which Western names (to be more precise, American names) are already selling fitness focused wearables in China? Well, Apple is charging ahead, selling 382,000 Apple Watches in April to June of this year in China. 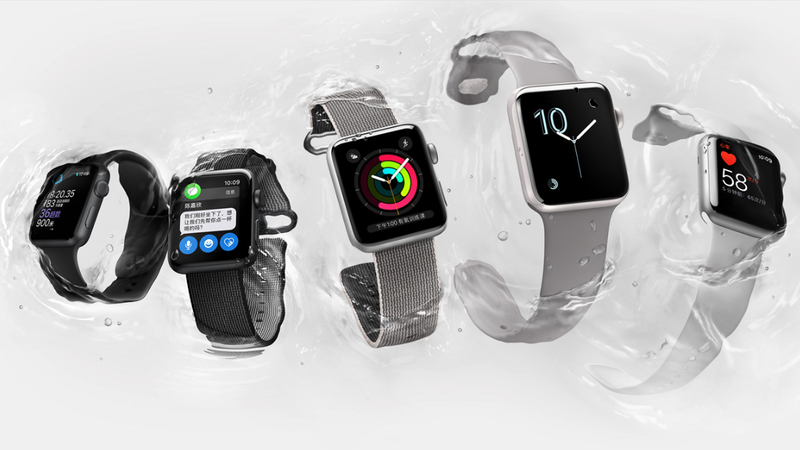 With its new waterproof Series 2 with built-in GPS, breathing exercises and swimming apps, plus designer straps, that should increase, maybe even double. One of the reasons those sales aren't higher is that the Watch was more expensive in China than elsewhere for a while. Now a Series 2 starts at 2,888Yuan for a 38mm model ($433) which is more comparable. It's not even too far a push to consider that the trends and investment signals coming from China may have emboldened Tim Cook and co to really push the fitness angle of Apple's second smartwatch. At that 300k a quarter rate, it could account for a tenth of total Watch sales if not more and it's no surprise to see communication features like Scribble work in English and Chinese only. We don't have the figures but we'd wager that next in sales is Fitbit, the bestselling wearable brand globally but not yet in the top five for China according to IDC since its launch in summer 2014. "We're the first Western brand to launch in China, there's obviously domestic brands there as well," James Park told us when we spoke to the Fitbit CEO at IFA 2016 recently. "For us, China is a pretty important market." Let's massively generalise again. While the simple fact that you have to wear a fitness wearable has been a problem to solve in private, buttoned-up countries like the UK, in China - as with the go-get-'em US - it's a selling point that everyone can see what's on your wrist. "We see the market there really bifurcated between really low cost devices and higher end devices like the Fitbit," says Park. "That's because there's a lot of social signalling in China. How much you spend on your health and fitness is reflected in the device that you wear so that's where we see a lot of promise." Then there's Misfit - now Fossil owned - which at one point boasted that it was outselling Fitbit (which launched later) in China with 660,000 wearables sold in the 18 months to summer 2015. "We've never seen anything like it, there is a lot of momentum in China," Sonny Vu, now president and CTO of connected devices at Fossil Group, told us after the Misfit Shine 2 launch last autumn. It sold 250,000 trackers in 24 hours following a big W Hotel Beijing launch event. Nike is another popular, imported sports brand in China with Nike+ Run Club hooking up with social network WeChat there. The Apple Watch Series 2 Nike+ seems to signal, though, that it's bowing out of fitness hardware itself and focusing on its platforms. Those "really low cost devices" we mentioned? They're essentially all Xiaomi smart bands. At least for now. Xiaomi, which you might recognise from Mi smartphones but actually makes any gadget or appliance you could think of in China, shifted 2.8 million Mi Band, Mi Band Pulse and Mi Band 2s in China in three months this summer, wiping out any competition. Why? Because they're so goddamn cheap and cheaper in China than you can get them elsewhere to boot. A Mi Band 2 - the one with the OLED screen and the optical heart rate monitor is 149Yuan. That's the equivalent of $22 and is the top of the range with the Pulse going for 99Yuan ($14) and the original Mi Band for around the same price. All are of limited use as activity, HR and sleep trackers but at that price, we're not surprised at the huge sales figures. Xiaomi's continued success is a given for the time being. What's more interesting is what Huami, its manufacturing and design partner is up to. Huami is the company behind the Amazfit smart jewellery and smartwatch devices, which it is bringing to the US and it's now valued at $1 billion - aka a new tech unicorn - and coincidentally the company who designed Xiaomi's bands inside and out. Fitness tracking wearables like the ceramic, waterproof Amazfit Moon Beam smart bracelet are affordable at $79.99 but nowhere near as cheap as a Xiaomi Mi Band. It's also worth noting that the algorithm for Amazfit's activity and sleep tracking is based on Xiaomi's technology since Huami helped design it in the first place, so there doesn't appear to be too much innovation on the actual tracking front. Huami's head of US marketing told us that Xiaomi is a big name in China and the Amazfit brand was Huami's chance to do something a bit different for the rest of the world. The design, though, will no doubt be a hit at home. "We found our inspiration from traditional Chinese jade pendants that also symbolise healthy lives in Chinese culture," industrial designer Pengtao Yu told us. "We also wanted the jade feel with our kind of material so we chose ceramic." Aside from the unstoppable forces of Xiaomi and Huami, in China itself the second biggest wearable tech company is Lifesense, which has sold over a million of its fitness trackers in Q2 of 2016. Its smart bands are - you guessed it - cheap and cheerful, handling steps, sleep and heart rate with an OLED screen and 30 day battery life. You can pick one up internationally for around $40 but the average score for the Android app is 1.9 stars with a lot of grumpy commenters. That's also not forgetting the 99Yuan ($14) Bong 2s which was crowdfunded on JD.com and offers much the same features. It's around $30 if you're buying outside China. This is a huge, billion user+ opportunity and it will be fascinating to see if the likes of Apple, Nike and Fitbit can convince the growing middle class of China that it's worth parting with more money for their health and fitness wearables. By next year, the top five wearable tech brands in China could look very different if US brands can top that other popular category - kids trackers. Right now, one thing is clear - the ludicrously cheap but below par activity tracking of Xiaomi (and its extremely similar rivals) are enough to satisfy the thirst for the health, wellbeing and fitness craze. And there's another thought. Say Chinese or American startups and tech giants pin all their wearable tech profits on millennials in China. By all accounts this is a group keen to jump on international trends like yoga or social workouts. The real test is making the Chinese quantified self a lifestyle, not just another craze.